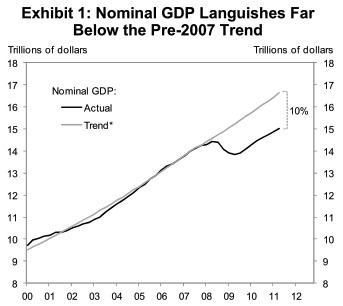 And one thing the market monetarists may have been right about is the usefulness of focusing on nominal GDP. As far as I can see, the underlying economics is about expected inflation; but stating the goal in terms of nominal GDP may nonetheless be a good idea, largely as a selling point, since it (a) is easier to make the case that we’ve fallen far below where we should be and (b) doesn’t sound so scary and anti-social. What do you want the Fed to say publicly? What open market operations do you want the Fed to engage in? Beyond that, is there anything else the Fed should be doing? This would cut through a lot of the confusion. The Fed is not infinitely powerful: For both legal and practical reasons, it has only a certain set of activities it can engage in. So tell me what specific activities you think it should engage in. This isn’t a panacea, of course. It would cut through a lot of the fog in one sense, but it would almost certainly create a whole bunch of new fog at the same time. Still, I think it would get us a bit closer to focusing on the underlying issues. To try to target nominal GDP using either only monetary policy or only fiscal policy seems hazardous. To coordinate—monetary and fiscal expansion, money printing-financed purchase of useful things—seems to be the winner. I’m on board with this. Monetary and fiscal policy both have limitations, and using them in tandem is almost certainly more effective in a recession like the current one. What’s more, why not? The downsides of expansionary fiscal policy are pretty small, so we’d be smart to simply throw everything we have at the problem.